I decided to change things up a bit and ask a bunch of questions of myself. 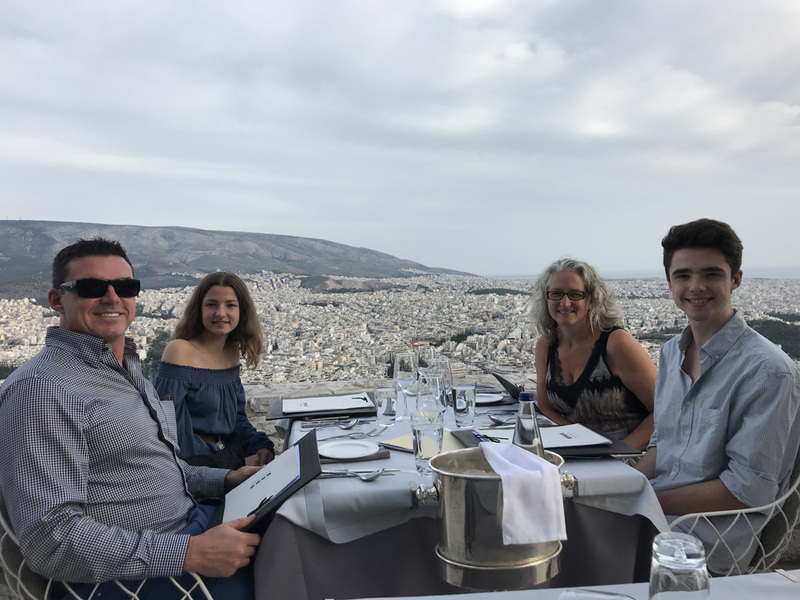 As I sit on a terrace of a little café in Athens, recording all our expenses, it gets me to thinking about costs versus benefits. I wonder if there is a way to reconcile the emotional gains we have made through the cash being allocated to the various budget categories? Q. What value would you associate to a family of 4 travelling the world for a year? A. This is extremely difficult to determine. Perhaps we need to sift through the time and set aside the treasures. That is to say, if we were trying to reduce the trip to the moments which are able to be portrayed on social media. There are so many other experiences, both good and bad which are not making it to photos or videos. There are even feelings, towards each other and the world around us, which slip by on the wind. Is there a way to assign a financial number to all this? Or is it truly priceless? As cliché as that sounds. Q. Have you learned what you expected? A. Everyone said, the kids are going to get such an education! Way better than if they sat in a classroom. Whenever I heard that, I wondered, what about me? I want to learn as well! We left with a feeling of uncertainty as it relates to gaining knowledge about the world around us. Our frame of reference was classrooms, teachers, formal lessons and tests. What we found was life, bursting at the seams everywhere we went. All we had to do was open our eyes and see. We had to take away the masks and the armor. Instead we were forced to look, listen and open our hearts. While living like the locals, as much as we could, we walked beside them. We felt the weight of their circumstances, but also the joy in small daily pleasures. Stuff we had lost track of in our own lives back home. Q. What was most surprising? A. How heavy fruits and vegetables are, particularly when carried over a kilometer in distance. I was so glad to have spent a lot of money on the most comfortable backpack ever. On a more serious note, I was humbled on a regular basis. Almost everyone we met was generous, especially once they learned we were long term travelers, not just vacationers. Being from Canada made people smile, to think of it, always. Q. How is it possible to live with roughly 23 kilograms per person? A. I guess you quickly get used to only what can fit in your luggage. The physical weight of it starts to feel heavy, the longer it needs to be carried. It becomes easy to let go of things when you remember how difficult it is to lug it all around with you. Carry it up flights of stairs or even roll it around a large airport. All of that sounds like the same old answer anyone gives, but it truly hits home over time and distance. What do you really need to thrive in this life? Not very many material things which are heavy, this I know for sure. Q. In hindsight, how would you pack differently? A. Next time, I would invest money up front to reduce weight even further. My big camera and tripod were too heavy. I would get a smaller battery to recharge my phone. I might even look for a different laptop model. Since clothes are easy to buy everywhere we have been, it might have made sense to rethink my choices. Only the lightest things which dry quickly make sense. We have not had the use of a proper dryer since we left Canada, so a laundromat was the only way to get everything really well dried out. I used my rain jacket so little, an umbrella might have been better. We were too warm tromping around Bali in our rain jackets. Q. Will this experience make you a minimalist? A. Probably not. But the effort of packing up our whole lives made us get rid of many things before we left. As I take my time putting it all back in the house, I am sure to let go of more. If I didn’t really miss it, in terms of beauty or usefulness, it won’t make the cut. There is only so much time and effort I want to spend on cleaning and maintaining material things. Q. Was it really worth it? A. Without a doubt yes. I would add a few caveats though. I needed to be prepared, so much so that I have written a book along the way, aimed at helping others do the same. It was important to me that we would have our basics ready to go when we got home, so we could slide back into our life. We rented our house instead of selling it. We kept our car and all our big-ticket furnishings. In a day or two, our house will be back up and running. Our goal was to live as we travelled as to not put too much pressure on our family to be off doing once in a lifetime activities every day. We were maintaining some normal habits, albeit remotely. Each of us know which cities and countries we would like to visit again, spending more time and doing more stuff. This kind of lifestyle makes you acutely aware of time. How much we waste it back home, waiting for happiness to come when the next milestone is reached. When we are travelling, there is always a feeling like we are in the best moment. When we are living in circumstances which are new to us, experiencing the local culture, eating the food and doing cool stuff – that becomes the best time yet. Each day, week and month becoming better than the last. In that way, the quality of time feels somewhat limitless. I like that. My challenge now is to live like this when we return home. Design the creative life which I don’t feel a need to take a vacation from.